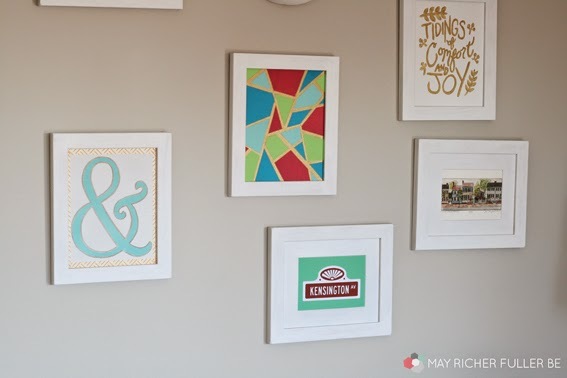 Tinkering with the gallery wall in the living room has been one of the most enjoyable things I've done with the decor in our apartment. It's easy, inexpensive and low risk to change it up every now and again. I hate that I have to take it down this week for our move! 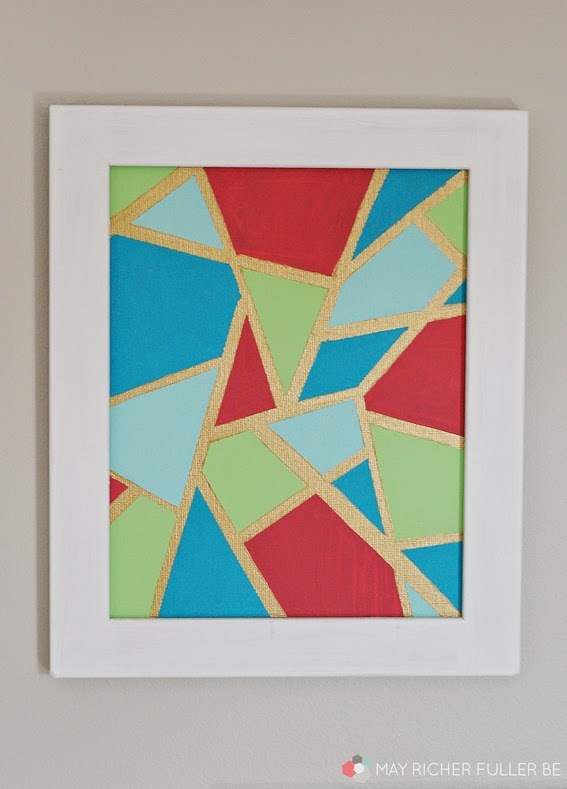 Before that happens though, I decided to try my hand at painting a little geometric abstract art to frame up and add some color to the gallery. I've been wanting to try something like this for awhile, and you know what? I think it turned out to be quite a lovely addition. 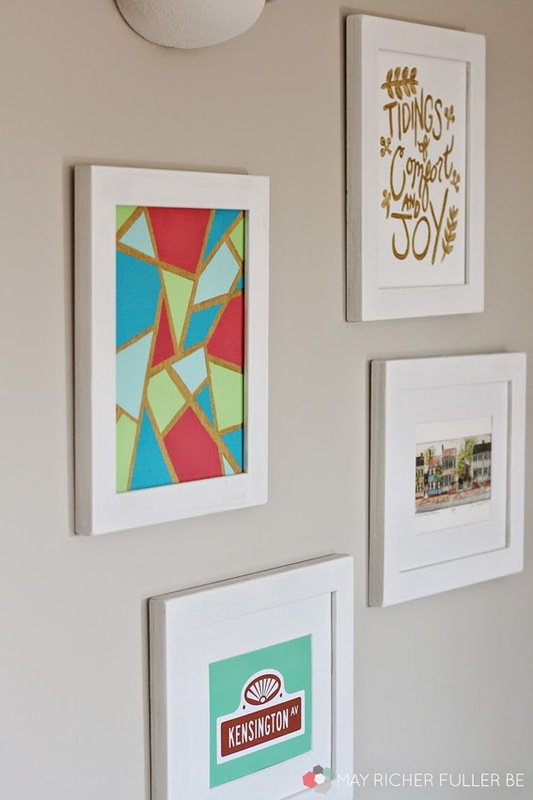 It's a really easy DIY, so I thought I'd share my process - which isn't much of one! - with you. This is definitely an "anyone can do it" (seriously) project. First, paint your entire canvas with several coats of gold. Allow that to dry completely. 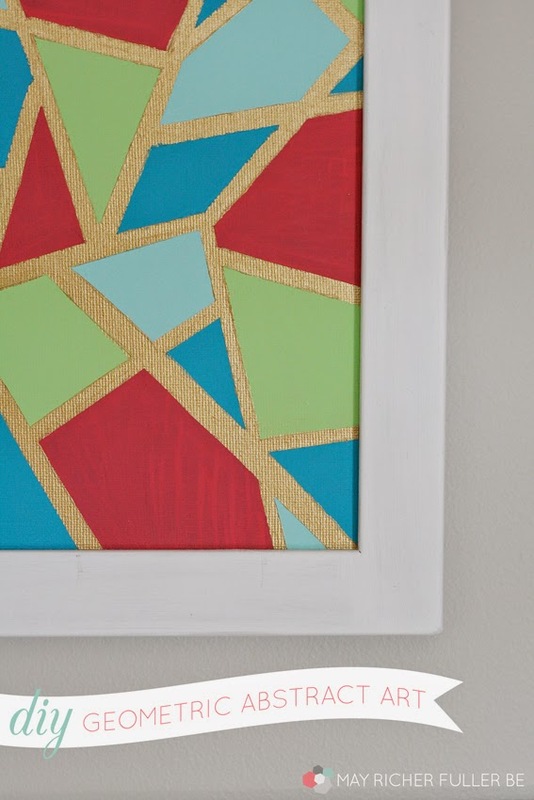 Then, use your X-acto knife to cut thin strips of painter's tape and place them randomly all over the canvas to form geometric shapes. I found the easiest way to cut the painter's tape into strips was to tear off a long strip, place it gently onto a piece of cardboard and cut that into several thinner strips. Don't worry about making them the same width - I think a bit of variation is good! One more hint? Make sure you press down the edges of the painter's tape to prevent the paint from bleeding under it. 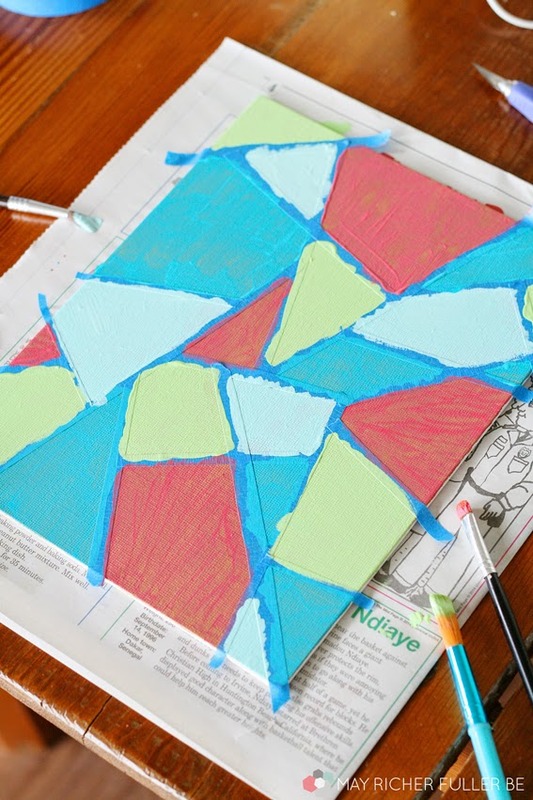 Next, fill in the shapes with several colors of paint. I went with four colors: pink, turquoise, light aqua and light green. I had to do several coats of each color to get good coverage. 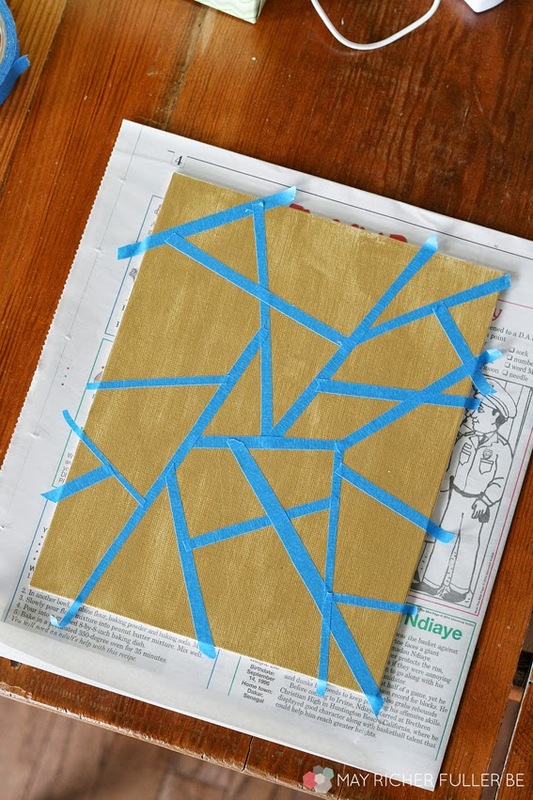 While the paint is still damp, peel the painter's tape off to reveal the pretty gold lines from the base coat. You may have to touch up the gold a bit (I did) if you had any paint bleed under the tape. Throw the canvas in a frame and that's it! 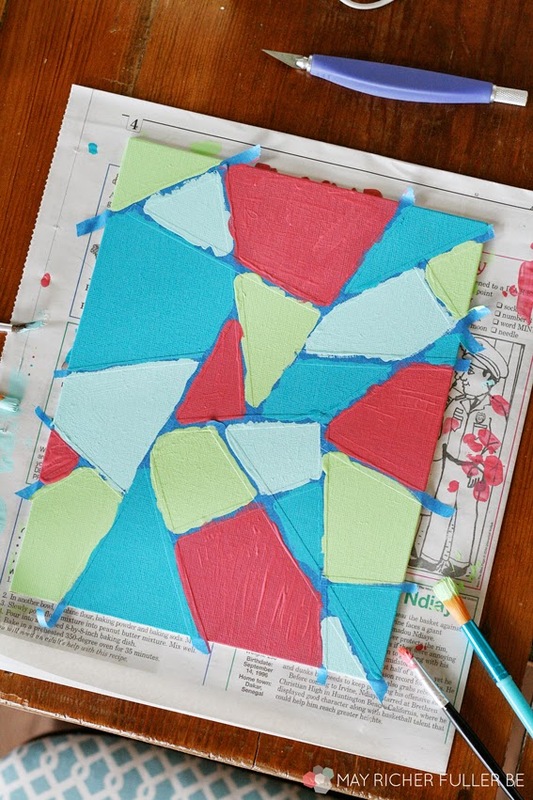 Pretty, simple abstract art - done in an afternoon! I love how shiny the gold is and how it makes the matte finish of the other colors really pop off the canvas. By the way, the gold is a Martha Stewart multi-surface craft paint that I'm crazy about. Martha sure does do craft supplies well. I was a little nervous about how this was going to turn out...it could've easily been a total flop, but hooray! It wasn't. I'd even call it a total success! It might have even given me the confidence to take on a much larger abstract painting in the future. We'll see! Have y'all ever made art like this? Any good tips or tricks I should know about for next time?